A holiday surprise of the most stunning kind sent directly from the grower! 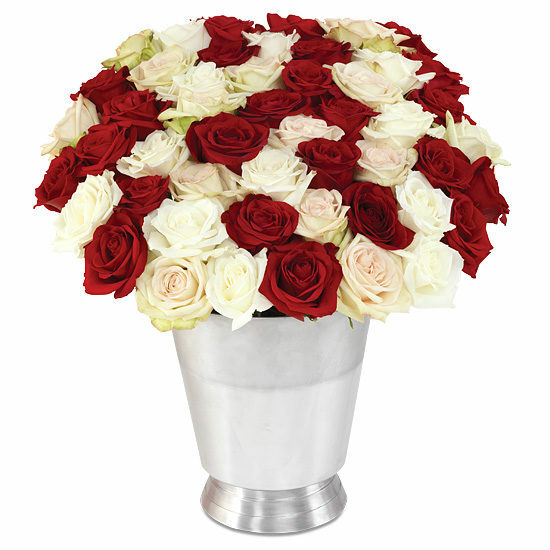 One hundred of our luxury roses in the quintessential shades of Christmastime arrive to fill the home or office of someone special in your life. We’ve displayed the luxurious combination of three different varieties (50 red Freedom, 25 Green Tea, and 25 Akito white) in our magnificently sized wine chiller sure to impress with its elegant silver finish. She’ll LOVE it! Remove all foliage that will fall below the water line. Remove the “guard petal” on each rose – this is the outermost petal left on to protect the bud during shipment. You may also remove any petals that may have slightly bruised during shipping. We recommend cutting all stems underwater for best blooming results. Some varieties of flowers may look a bit tired upon arrival. Don’t despair! They’re healthy – just thirsty. They will rehydrate within 24 hours.